Just over a century ago, the world was only then beginning to dabble in central cooling solutions for unbearably warm summers. The problem was, anything that effectively made comfortable an entire home was more than likely incredibly large and terribly expensive to operate. Those were not times of compact-this, and shrinking-that – it was more about revolutionizing the way we thought about being comfortable and the luxuries that might be involved in developing such systems. With the last Great War soundly behind us, the world was able to take a collective deep breath and start thinking about wants, instead of mere survival and needs. 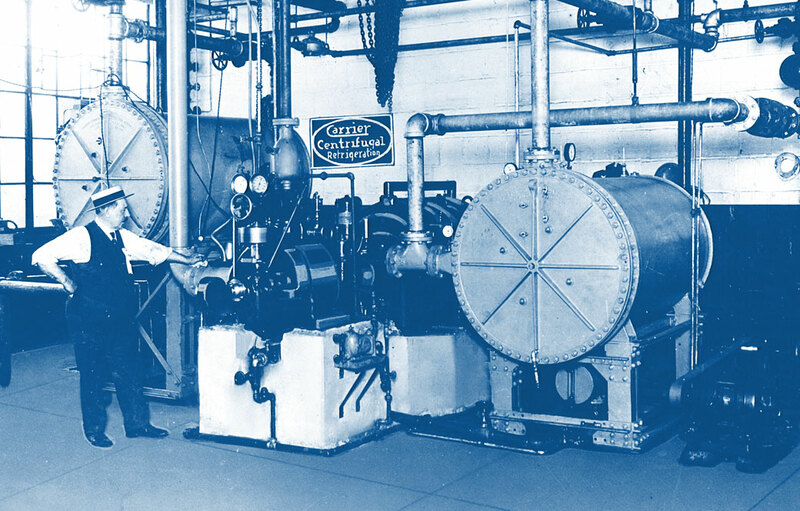 Photo : Shown in the Carrier plant in 1922, the first centrifugal chiller opened the door to large-scale comfort air conditioning. The idea for central cooling systems sprang up right before the turn of the 20th century, with the first 300-ton indoor air conditioners being installed in 1902 at the New York Stock Exchange. Not exactly made for commercial distribution but a fascinating luxury unto itself, more and more people got the bug for clean, on-demand air and demanded systems able to be taken home for personal pleasure. Four years after that first system was installed, a building was designed to house an air conditioning unit that ran on safe, effective carbon dioxide – the first of its kind and a noticeable improvement in current indoor air standards. A modern day ducted inverter unit from GMC air conditioning. The demand for air conditioners grows. Within 10 years of the unit at NYSE, the market had exploded as everyone clamored for a delicious slice of indoor air and the chance to live high on the hog. The world saw once-uncomfortable meeting places like hospitals, churches and meeting halls become opulent with the adoption of the fancy air conditioning unit sweeping across the planet and taking everyone by storm. Personal, self-contained household air conditioning units were market to the public in 1929, proving that technology had advanced beyond the point of a mere pipe dream to a conceivable reality available to the mass consumer market. By the late 1940’s, window air conditioners were being produced en masse as their popularity drastically increased when technology allowed for more affordability in a smaller size unit. As science discovered better fuels and cooler refrigerants, the air conditioners changed in size and efficiency to accommodate a new design allowing for more streamlining, both internally and externally. No longer did they have to take up the entire basement floor, or a large part of your backyard because of the unsightly design and possibly dangerous chemicals. Models were being designed to fit a range of incomes and budgets, proving to be one of the most luxurious inventions of the 20th century. A modern day Evaporative cooler from GMC Aircon. Central air units used to be loud and unwieldy, sitting outside the house because of their size and generating enough sound to be heard over the TV. They required more maintenance than current models of today, keeping the cooling repairmen on their feet for the next inevitable breakdown. Little concern was given to the safety of the environment, as technology was still fairly knew and developing every year. As the popularity of these cooling systems grew, so did the demand for something smaller, more compact, more inexpensive to operate and able to be placed just about anywhere for convenient air at the touch of a button. Around the time GMC Aircon came into business, traditional cooling units would use up to 6,000 watts of energy per hour just to cool a home of the average size and an unhealthy dose of ozone-eating chlorine, the effects of which were not known at the time. Now, thanks to rapid advances in cooling technology, a new chlorine-free refrigerant is on the market for a safer alternative than previously conceived. Cooling systems have increased an amazing 250% in efficiency and can now operate on 1,710 watts an hour – an astronomical figure for the heating and cooling industry. Units that provide a central source of cooling for an entire building are a luxury to some, too extravagant for others but everyone agrees that it can be completely necessary on swelteringly hot, muggy days. Many people have concerns over energy consumption while running the units, or the damaging costs to the atmosphere from the ample refrigerants required to run. Even a decade ago, these concerns would have been valid – green energy and environmental friendliness were just starting to come into fashion, with more and more companies jumping on the eco-bandwagon and riding it into the future. This new refrigerant, known as R410A, has caused quite the stir in the cooling world, leading GMC Aircon to quickly adapt the new advancement and integrate it into their line of products four years ago. Their foremost air conditioning unit uses inverter technology coupled with the R410A for dramatically improved eco-friendly awareness, and can provide a 30-40% decrease in overall energy uses. Compared to traditional constant speed air conditioners, this bit of information will hit consumers where the wallet is, adding extra incentive to the decision to install a GMC Air conditioner unit. These cooling systems ultimately reduce the primary and secondary cable size, cutting the costs of power supplies to the buildings and equipment that utilize this technology – that’s a change everyone can be happy with. From carbon dioxide to Freon to chlorine and now R410A, each step in a stone in the path for a safer, greener environment and better environments for generations to come. GMC Aircon is not only South Africa’s leading heating and cooling distributor , but they are leading the revolution in advanced technology for the entire industry. In operation for almost 20 years, they proudly take the lead when it comes to the best in home and business air conditioners and have worked tirelessly to make their complete solutions for indoor environmental regulation as eco-friendly and efficient as possible. Going green is just one portion of GMC Aircon’s hand in cooling advancements; they also directly contribute to the research and development of new technologies to improve on their existing systems, ultimately leading to greater customer satisfaction and a more stable clientele. Their mission is to not only use the most environmentally-friendly cooling options available, but to conserve our earth’s natural resources while providing a satisfying indoor environment for everyone. GMC prides itself on understanding nature and having an honest respect for employees and management, a system they believe allows for more innovative research and close-knit connection to their large network of clients and consumers. 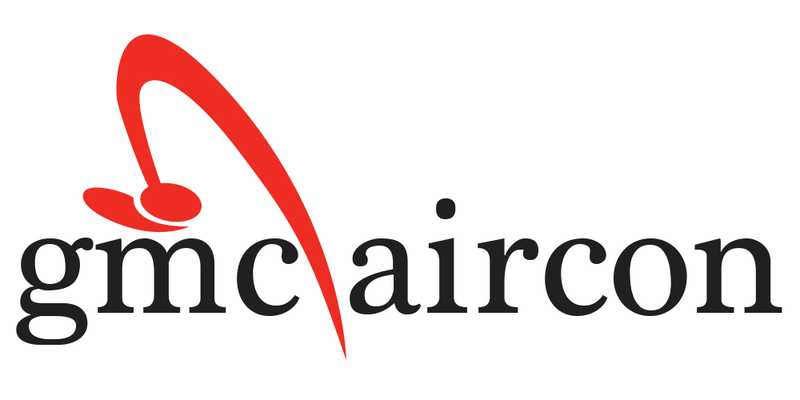 Trustworthy and outstanding in technology, GMC Aircon has the drive and ambition to be South Africa’s leading heating and cooling supplier as well as number one in the customer satisfaction field. With their expertise in importing and distributing the best air conditioning units around, they offer superior levels of technical prowess and friendly one-on-one assistance with all types of questions and concerns you may have. Thousands of customers and clients can attest to their punctual delivery and always-available service from guaranteed certified technicians and dedicated team of professionals. Click on any of the images below to get the brochure. If you would like to find out more on how the GMC team can help you then please get in touch with one our friendly staff who will be more than happy to help you with any questions you may have. If you’re looking for more Technical information on our Air conditioners or would like to enquire about the best air conditioners for your home or office , you can contact us using the form below. You can also view more information about our Commercial Heat Pumps here. Air conditioners from GMC Aircon- efficient technology for lifestyle comfort.